The Inverted Pyramid as it appears in the Sand Kingdom brochure. The Inverted Pyramid is a location in the Sand Kingdom in Super Mario Odyssey. It is a location towering above the rest of the kingdom, and resembles an upside-down pyramid, hence its name. The inside of the pyramid features Bullet Bills, the sides of the pyramid feature 8-bit sections with Goombas, and Hariet is fought for the first time at the top of the pyramid. After Hariet is defeated, the Inverted Pyramid floats into the air, allowing the player to enter a large hole revealed underneath. 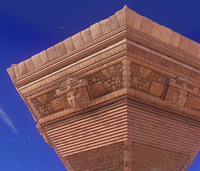 The Inverted Pyramid reappears in the Nintendo Switch and Nintendo 3DS ports of Captain Toad: Treasure Tracker, in the level Secret of the Inverted Pyramid. A Pull Switch is found on top of the pyramid, and causes it to float into the air when pulled. This page was last edited on January 3, 2019, at 22:38.